>Cold connections is the term used when you need to join a metal to a metal [or any object really] and are going to do that with out a torch. So no soldering. Rivets are a common join.. also, small hinges.. eyelets.. and of course, wire-wrapping is considered a cold join. Hopefully any hammering that I’m doing is not bothering anyone around me. yikes..
I’ve cushioned it on a small leather pillow on the carpeted floor and really its not necessary to hammer too much. I’m not forging horse shoes after all. Anyway.. thankfully, there have been no complaints. >really rad. like it. lots.especially the flat hammered parts. nice dimension. You are currently reading >Forging a copper chain at fireandglass. 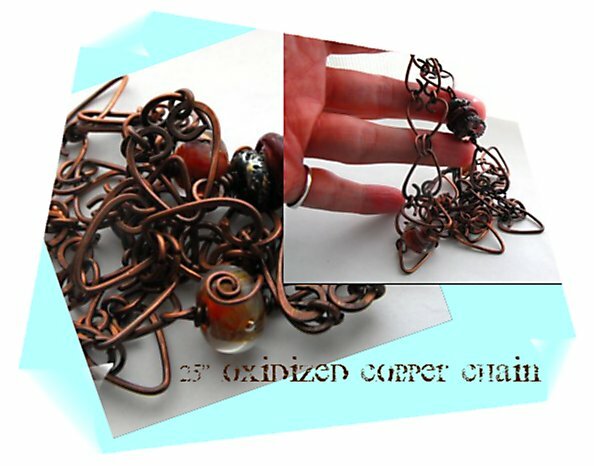 Categories: cold connections, copper chain, copper chain and lampwork, forging copper chain, necklace, oxidized copper.